A gargantuan display commissioned for use in a traveling art exhibit. 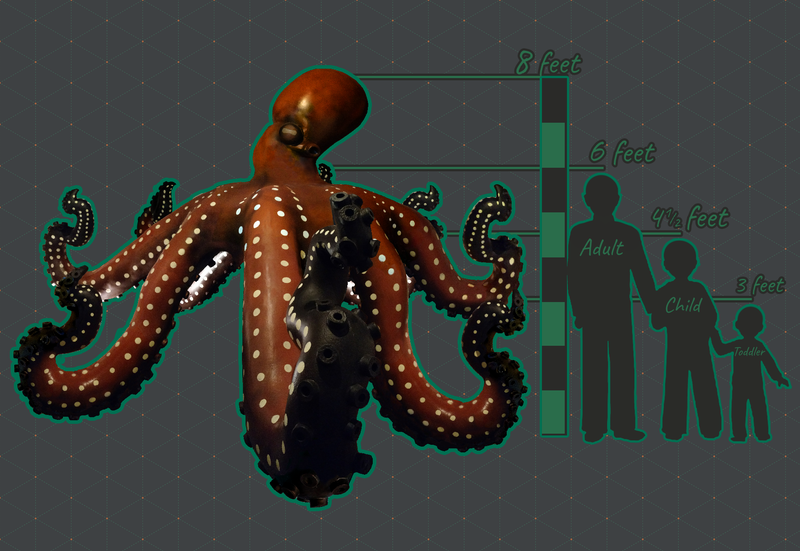 This piece is being used to spread awareness about the negative effects of oceanic garbage and manmade debris on wildlife; the client wanted to have a “larger than life octopus huge enough to enspire awe and draw attention” which would hold an iPad in each limb so that visitors could watch an educational video. The sculpture needed to be easily dismantled into individual components which an average adult could handle with no more than a second adult, and with no tools, to assist in assembly, dismantlement, and relocation. It was also critical that half of the limbs be low enough for small children to view the screens, while the other half be high enough for an adult; the lower 4 limbs serve as legs to support the entire sculpture, while the upper 4 hang freely in the air. Custom iPad cases were crafted from sheet acrylic (Plexiglas®) to detern theft and vandalism, while an integrated custom charging harness with industrial power supplies was embedded within the torso. 8 individual copper wires originates from the underside of the torso, leading down each limb with a quickrelease fixture at the midpoint where each limb attaches to the torso. Each wire then travels the length of their respective limb and terminates at the grasping point at the tip of said limbs. The limbs themselves have a steel tubing skeleton within to provide support and serve as an anchor point to attach to the body’s own steel skeleton with the use of a simple ring-pull pin. The head mounts atop the torso with a single tube which extends throughout the torso with an exposed hoop which can then be used as a tiedown point for securing the display in the event of any unsexpected high winds. For the vast majority of this project I worked solo (due to budget constraints), dedicating 12 hours a day, 6 days a week, for the entire duration of the project; this was done in order to meet the client’s (albeit unrealistic) demands that this project, as well as its sister sculpture, both be completed within 6 months. It was only within the final month of the project timeline that I was clinically diagnosed with carpal tunnel syndrome, depression, anxiety, and RSI as a direct result of this project. I was put into forearm casts, medicated, and as such, I enlisted the aid of 3 local artisans out of my own pocket to assist so that the project would be delivered on time. MY assistants aided in the sanding and finishing of the EZ-Spray® Styrocoat® surfaces once I coated them with Bondo® to give a silky smooth texture to the bulk of the surfaces. Expanded polystyrene (EPS/Styrofoam™), Smooth-On EZ-Spray® Styrocoat®, Bondo®, steel, copper wiring, industrial power supplies, sheet acrylic (Plexiglas®), acrylic spray paint.